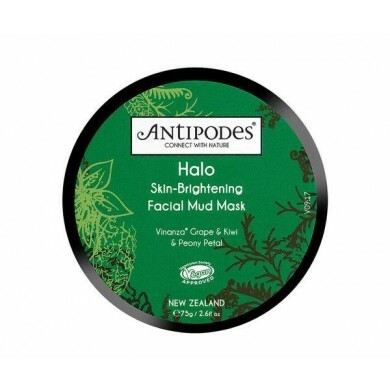 Antipodes HALO Skin-Brightening Facial Mud Mask is a mineral-rich face mask formulated with the highest quality botanical extracts and volcanic mud from the New Zealand’s geothermal plateau. This beautifully scented mask features a pure plant fragrance of vanilla pod, raspberry seed and musk; it provides an effective way to instantly freshen and illuminate skin. The addition of this facial mud mask into your daily ritual is an effective way to detox and brighten your skin. Halo’s bio-active and mineral-rich formulation will appeal to those seeking a balanced and sustainable lifestyle. 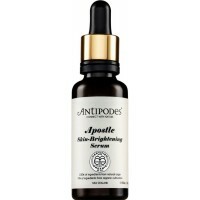 Antipodes Halo Mask contains skin-brightening natural compounds to achieve glowing, radiant skin quickly and effectively. Blended with nutrient-rich avocado oil to give it a super silky texture, Halo is a delight to use and has a surprisingly light skin-feel. Revolutionary antioxidant compound Vinanza Grape & Kiwi has been clinically shown* to lighten skin by targeting the over-production of melanin that can lead to freckling, pigmentation and uneven skin tone. Extract of prized peony flower also contributes to a bright and luminous visage. 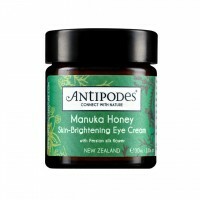 Suitable for most skin types, especially congested, dull and combination skin. 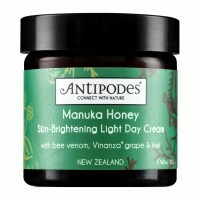 Antipodes HALO Skin-Brightening Mask is certified vegan by the UK Vegetarian Society. It is packaged in the recyclable PETG plastic jar and 100% biodegradable cardboard box from sustainable forests. 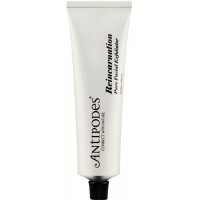 Volcanic Mud - packed with skin benefiting calcium, silicon, sodium and sulphur. 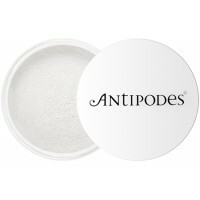 This mineral-rich mud absorbs skin’s oils and helps to remove dirt, impurities and pollution residue once rinsed off. Vinanza Grape and Kiwi - a revolutionary antioxidant compound created by Antipodes that has been clinically shown to lighten and improve skin appearance by targeting the overproduction of melanin that can cause freckles, pigmentation and uneven skin tone. Peony Flower - contributes to a bright and luminous complexion. Avocado Oil - this nourishing oil is packed with Vitamins A, B1, C and D, and Omegas 3 and 9; it keeps skin well hydrated and moisturised. 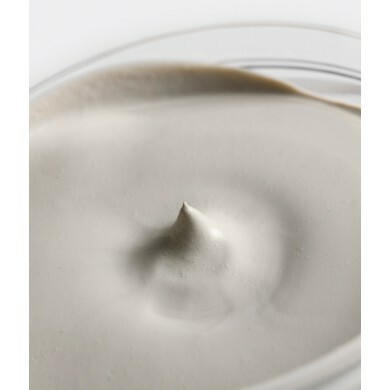 Lavish a thick layer of this creamy mask over your cleansed face and neck, avoiding the eye area. Leave for 15 minutes, and rinse away thoroughly with warm water. Use twice a week. 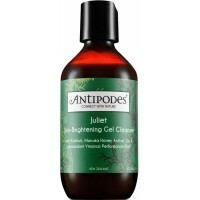 Ingredients Aqua (water), kaolin, volcanic New Zealand mud, glycerine, propanediol (natural) , Simoondsia chinesis (jojoba) esters, zinc oxide, gluconolactone & sodium benzoate, magnesium aluminium silicate, butylene glycol, arbutin, citric acid, sodium sulphite, acetyl tyrosine, Saxifraga sarmentosa ( strawberry begonia) extract, Paeonias suffruticosa (peony) root extract, aminopropyl ascorbyl phosphate, Scutellaria baicalenssi (skullcap) root extract, glutathione, dehydroacetic acid, benzyl alcohol, xanthan gum, Pongamia glabra (Indian beech) seed oil, Asteriscus graveolens (oxeye) flower extract, Persea gratissima (avocado) pear oil, coco-glucoside, Vinanza Grape & Kiwi (Vitis vinifera [grape] seed & Actinidia deliciosa [kiwiw] fruit) extract, pure plant fragrance of vanilla, raspberry, wild berry & musk: benzyl salicylate, citral, citronellol, geraniol, d-Limonese, linalool.